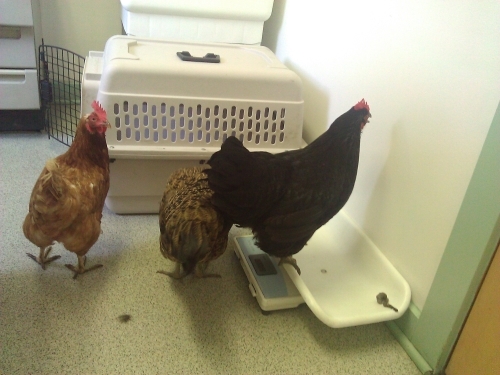 Ok when we last left our avian heroines, they had passed the weight test at the vet. But it was time for a closer look. 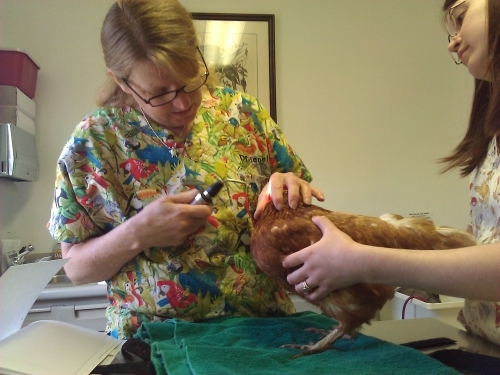 Here is Dr. Tracy Bennett with the help of an able assistant, shining a bright light on Shy Chicken (who we presume is not liking it very much). 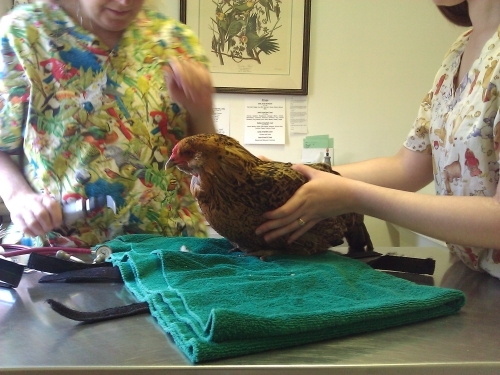 The vet apparently called Shy Chicken the Omega Chicken (as opposed to Bossy, the obvious Alpha Chicken). 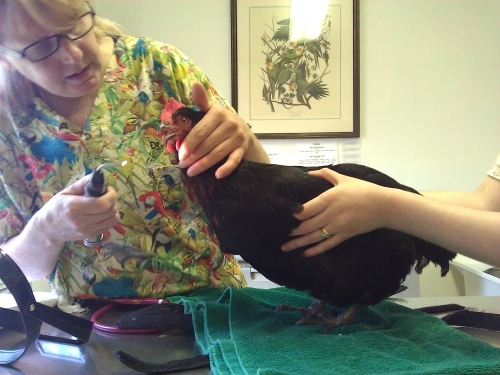 In addition to looking at Shy Chicken’s bald spot, the doc also looked at the butts and other areas of the chicken. Here, Bossy noisily complains of the strange experience. I suspect when it comes down to it, none of them are entirely graceful patients. The doc was amazed at how big Bossy has gotten. Jason silently wonders: Will she ever stop growing? In the end however, all the chickens received clean bills (and butts) of health. Jason said they all are fine, the feather loss is normal, and not to worry. This entry was posted in Uncategorized and tagged chicken diseases, chicken health. Bookmark the permalink.